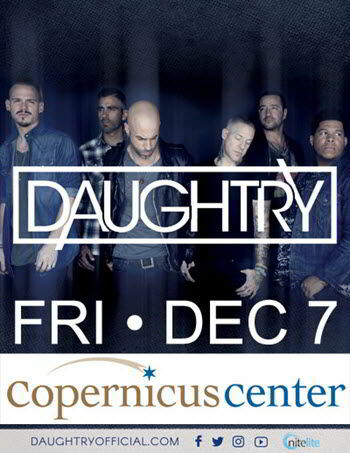 Grammy nominated and multi-platinum selling band Daughtry will be performing one concert in Chicago on Friday, December 7th. Opening up for Daughtry will be local rock group Friday Pilots Club, who recently won the Chicago leg of the Next2Rock national music discovery contest. For more on the group, visit https://www.fridaypilotsclub.com/. Daughtry released their new single “Deep End” on June 6. The anthemic song is featured on the band’s 5th studio album Cage To Rattle, available now via 19 Recordings/RCA Records. For special fan club pre-sales and ticket information please visit www.daughtryofficial.com. For the newly announced dates in the US, every pair of tickets purchased online will include one physical CD copy of Cage To Rattle. Customers will receive an email with instructions on how to redeem their album.